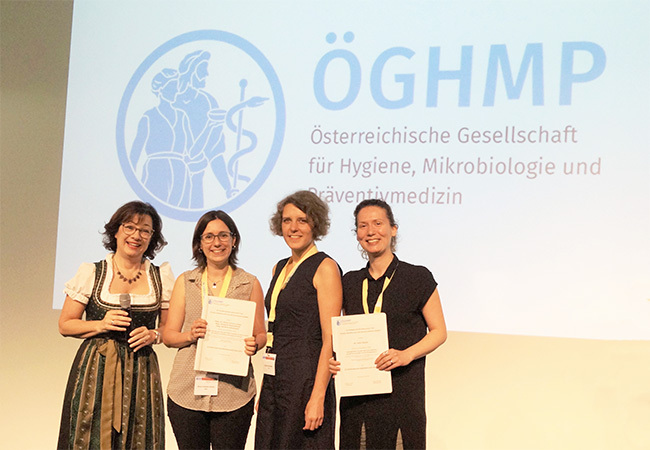 After 2016, the ICC Water & Health achieved another great scientific double success: at the 36th Annual Meeting of the Austrian Society for Hygiene, Microbiology and Preventive Medicine, which took place in Graz from June 4 to 7, 2018, both the Austrian Hygiene Award and the Austrian Microbiology Award 2018 were awarded to employees of the ICC Water & Health. A great success of the cooperation within the interuniversity cooperation of the TU Wien, the Medical University Vienna and the Karl Landsteiner University in Krems. 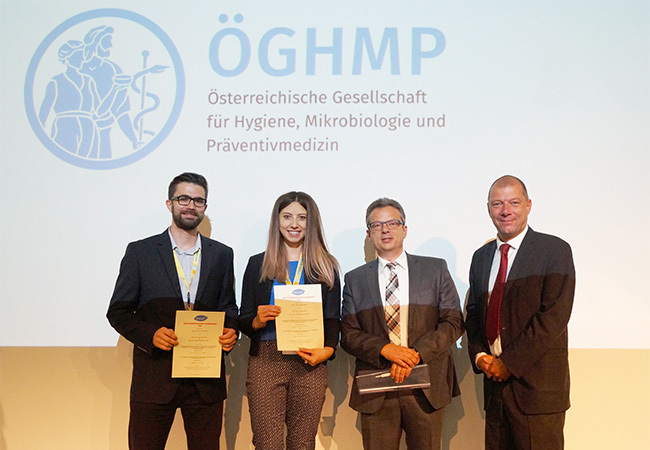 This year's Austrian Hygiene Award was awarded to our two PhD students DI Claudia Kolm and Roland Martzy from the Molecular Diagnostics Group of the TU Vienna at the IFA Tulln under the direction of Dr. Georg Reischer (part of the TU Research Group Prof. Farnleitner) for their work* on the topic "Rapid methods for detecting faecal contamination". Both studies are concerned with the development and evaluation of isothermal amplification methods for the detection of enterococci in water and aim at the 23S rRNA gene as a marker for faecal contamination. To provide specific and simple detection, Claudia used a Helicase-Dependent Amplification method, while LAMP (Loop-mediated isothermal amplification) was the method of choice in Roland's work. The microbiological methods currently used to detect faecal contamination require a complex laboratory infrastructure and only provide results after one day. In contrast, the newly developed methods could be used on site and without a laboratory and provide information on contamination within one hour. The work resulted from the "IsoAmp" project funded by the Lower Austrian Education and Research Society (NFB) and from the FWF stand-alone project "Health Relevance of VBNC Legionellae". The Austrian Microbiology Award 2018 went to our two employees Dr. Silvia Cervero-Aragó and Barbara Schrammel in the team of Prof. Alexander Kirschner from the Department of Water Hygiene (head: Prof. Regina Sommer) at the Medical University of Vienna for their work** on viable but nonculturable legionellae. Legionellae are the cause of Legionnaire's disease, one of the most common water-borne infectious diseases in industrial countries. Legionella is usually quantified in water samples using cultivation methods, but many recent studies have shown that the number of viable but nonculturable (VBNC) Legionella cells in water distribution systems can be many times higher than the number of culturable Legionella cells. The investigations tried to assess the potential health relevance of these VBNC Legionella by determining their viability with modern cytometric methods and their infectivity for human cell cultures in laboratory experiments. It was shown for the first time that 1) a considerable proportion of VBNC Legionella retain their viability over a long period of time and 2) these VBNC Legionella can directly infect human macrophages. However, this happens with significantly lower efficiency (longer infection time, higher infection dose, lower number of infected host cells) than with culturable cells. A health relevance can therefore not be excluded, protracted disease progressions in immunocompromised persons could be explained by this.